Folgers Decaf Filter Pack Office Coffee. What a great idea for commercial coffee brewers. These filter packs are designed to easily fit into the brew basket, yet not allow excess water to flow around so you get full extraction and consistent taste. Job well done Folgers!! 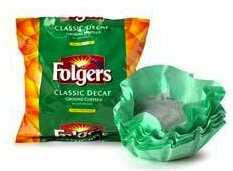 Folgers Decaff Filter Pack Coffee comes in a 40 count case. 4 individually sealed "bulk" bags with 10 full pot filter packs each.